Throughout her life, she drew and painted specimens, and fungi were her particular favourites, due to their colours and prevalence in nature. Particularly interesting are her microscopic drawings of their spores (the agarics). In 1895, she even developed a theory of their germination and hybridisation. However, when Potter wrote up her conclusions and submitted her paper entitled On the Germination of the Spores of the Agaricineae, to the Linnean Society, she was agressivey snubbed by William Thiselton-Dyer, the Director at Kew, because of her gender and her amateur status. Her studies were pushed aside and shelved. The Society had to draft a formal letter of apology to Potter in 1997. Potter had an evident artistic side, which seemed to be genetic: “Her father, Rupert, a prosperous businessman and lawyer, was an amateur artist and photographer who collected paintings, attended gallery exhibitions, and encouraged Beatrix and her younger brother Bertram in their art. Her mother, Helen Beatrix, was accomplished in the arts and joined the family in frequent drawing excursions during summer vacations in Scotland and northern England’s Lake District. (Catherine Golden ). Beatrix also received private art training and considered a career in art, however was discouraged, once again, by it being predominantly male dominated: “Art, only art … the animal detail of Rosa Bonheur and Landseer, the bucolic vision of Palmer and Constable, these were what fascinated her; yet here was the inevitable impediment-how could she presume to think of entering the grandiose world so genially dominated both at home and at the Academy by Millais” . (Margaret Lane, The Magic Years of Beatrix Potter,1978). Victorian women were rather limited in their career choices and, as a result, most became book or postcard illustrators. Their home-based jobs were considered to require mediocre talent. However, Potter’s work has recently been rediscovered, along with the rich, artistic naturalist illustrations and drawings that accompanied her scientific papers. Some of her mycological drawings were donated by her to the Armitt Museum and Library in Ambleside, where they are still employed today, as well as to Perth Museum and Art Gallery in Perth, Scotland. The mycologist W.P.K. Findlay included 59 of Potter’s fungus watercolours as illustrations in his natural history book Wayside & Woodland Fungi book published in 1967. 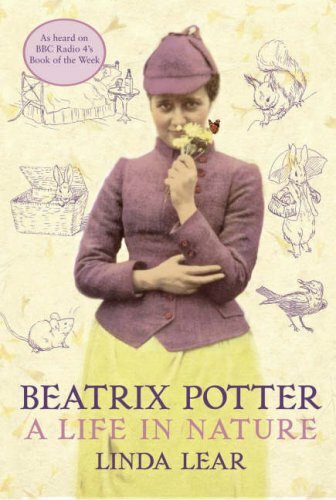 Linda Lear’s biography Beatrix Potter: A Life in Nature (2007), based on Potter’s letters and journal entries, attempts to shed light on Potter’s life as an agriculturist too. In her last years, “Potter continued her interest in fungi when she found out about the developments in research into penicillin—work that confirmed some of her own earlier findings—and that she was fascinated by the sounds made by toads and newts, having read about them in the newspaper. She also still occasionally drew. But the later life in nature became a gruelling struggle. Keeping stock alive and farms working was time consuming, and Potter’s insights into the biological world were either about farm animals or were stimulated by reading the news rather than by an urge to see and discover. Always a bit prickly, like her beloved hedgehogs, in this last period Potter— previously seen as a realist—becomes both a philanthropist and a bit of a misanthrope”, all the while though preoccupied with preservation and conservation. (Barbara T. Gates, review of Linda Lear’s book Beatrix Potter: A Life in Nature, in Isis, Vol. 98, No. 3, September 2007). Feature Image: Beatrix Potter: Youthful Drawing of Caterpillars, Original maintained at the Victoria and Albert Museum, in London. The characters of Beatrix Potter are so tranquil and heart-warming. A woman I so admire. My Mum used to call me Rebecca Puddleduck as a small girl !